Rock violinist Asha Mevlana's tiny home featuring an AZEK Deck for music outdoors competed with larger homes to win the #1 one ranking in Dwell Magazines' Top 20 Homes of 2017. Located in a wooded setting, the home's focal point deck joins two structures and features a giant amplifier--perfect for Mevlana's Viper electric violin. Asha entertains friends and family on her AZEK Deck, the focal point of her award-winning tiny home. I love to practice my music on the deck barefoot and without a care in the world, says Asha Mevlana. She says AZEK's natural colors blend right in with the woodland environment. Rock violinist Asha Mevlana, most known for performances with Trans Siberian Orchestra’s West Coast tour, was thrilled to have her tiny home selected as the #1 home on Dwell’s list of Top 20 homes of 2017. 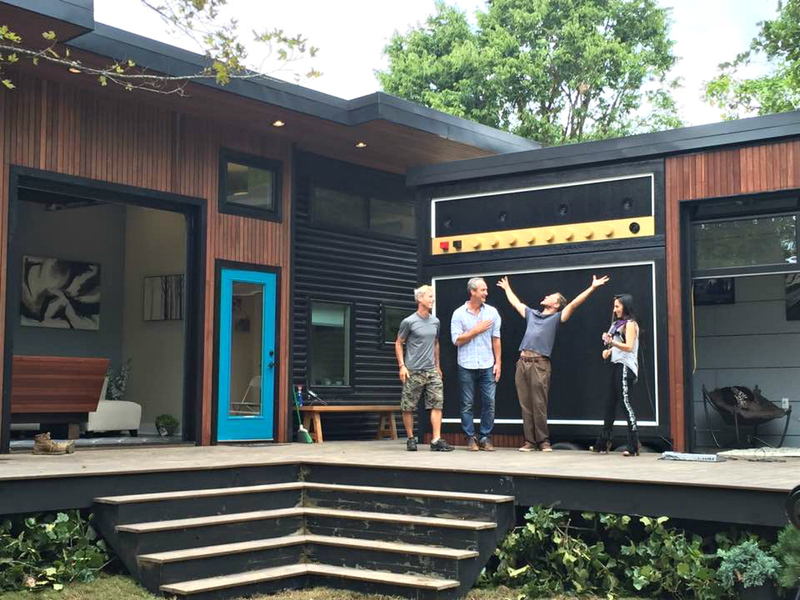 The renowned musician’s home in Fayettville, Arkansas, came to life on FYI TV’s “Tiny House Nation” a year ago, but recently the home competed with other, larger homes around the world for the magazine’s top spot. The woodland dwelling features two separate structures joined by an AZEK Deck with an enormous wall-sized amplifier so Mevlana can play her Viper seven-string electric violin. Learn more about Asha Mevlana on her website https://www.ashamevlana.com and in Dwell’s Top 20 List https://www.dwell.com/article/dwell-communitys-top-20-homes-of-2017-6a99faae. For more details about AZEK Decking, visit http://www.azek.com. AZEK Building Products, a division of The AZEK® Company, is a leader in the development of premium, low-maintenance exterior building products. Available to a worldwide audience, our product lines span AZEK® Deck, Rail, Trim, Moulding, Porch, Pavers, and Adhesives, as well as capped wood composite decking and railing under the TimberTech® name. Both brands, synonymous with quality and innovation and made in America, lead their market areas by continually reinventing product lines and redefining entire product categories. For more information about AZEK, visit http://www.azek.com. For more information on TimberTech, visit http://www.timbertech.com. Splinter-free entertaining makes Asha's deck one of her favorite hang outs.